Etlingera elatior (also known as torch ginger, ginger flower, red ginger lily, torch lily, wild ginger, combrang, bunga kantan, Philippine wax flower, 火炬姜 (pinyin: Huǒjù jiāng), Indonesian tall ginger, boca de dragón, rose de porcelaine, and porcelain rose) is a species of herbaceous perennial plant. Botanical synonyms include Nicolaia elatior, Phaeomeria magnifica, Nicolaia speciosa, Phaeomeria speciosa, Alpinia elatior, and Alpinia magnifica. In Karo, it is known as asam cekala (asam meaning 'sour'), and the flower buds, but more importantly the ripe seed pods, which are packed with small black seeds, are an essential ingredient of the Karo version of sayur asam, and are particularly suited to cooking fresh fish. From the leaves of E. elatior, three caffeoylquinic acids, including chlorogenic acid (CGA), and three flavonoids, quercitrin, isoquercitrin and catechin, have been isolated. Content of CGA was significantly higher than flowers of Lonicera japonica (Japanese honeysuckle), the commercial source. A protocol for producing a standardized herbal extract of CGA from leaves of E. elatior (40%) has been developed, compared to commercial CGA extracts from honeysuckle flowers (25%). ^ Chan, E.W.C. ; Lim, Y.Y. ; Ling, S.K. ; Tan, S.P. ; Lim, K.K. ; Khoo, M.G.H. ; et al. (2009). "Caffeoylquinic acids from leaves of Etlingera species (Zingiberaceae)". LWT - Food Science and Technology. 42 (5): 1026–1030. doi:10.1016/j.lwt.2009.01.003. ^ a b c d Chan, E.W.C. ; Lim, Y.Y. ; Wong, L.F.; Lianto, F.S. ; Wong, S.K. ; Lim, K.K. ; Joe, C.E. ; Lim, T.Y. ; et al. (2008). "Antioxidant and tyrosinase inhibition properties of leaves and rhizomes of ginger species". Food Chemistry. 109 (3): 477–483. doi:10.1016/j.foodchem.2008.02.016. ^ a b Chan, E.W.C. ; Lim, Y; Wong, S; Lim, K; Tan, S; Lianto, F; Yong, M; et al. (2009). "Effects of different drying methods on the antioxidant properties of leaves and tea of ginger species". Food Chemistry. 113 (1): 166–172. doi:10.1016/j.foodchem.2008.07.090. 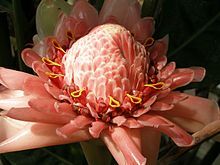 Wikimedia Commons has media related to Etlingera elatior.